Shadow of the Colossus understood that all games, in some form or another, are about exploration. Whether it’s an exploration of an alien world, a familiar world, or a set of interlocking mechanics, games rely on your curiosity to poke and prod what’s in front of you. That’s the nature of play, a back-and-forth of question and answer. Can I do this? Why can’t I do this? What is that? How is that? It’s a brilliant conversation between player and game. Team Ico’s symbolic and intricately detailed fantasy game is carefully constructed to answer these questions, if you ask them. It has an ancient world with a history, and characters with motivation and background. It presents them as a slice of a complete whole and lets you create your own interpretations based on what you see and feel. It’s not interested in explicitly describing itself, because much of it is revealed through playing it. There are other games that reach the same heights of this satisfying player-game relationship as Shadow of the Colossus. Games like Dark Souls and Journey, despite being very different games, deliver worlds and narratives that don’t function as well without your input. These types of games need to be played to be understood. And when you do, you grow an intimate familiarity with them; their worlds become places you think of, like cities or locations you’ve visited that are nestled in your memory. The combination of visual palette, sound, and tactile feel combine into something tangible enough to spark nostalgia in remembrance. These are incredibly special experiences that feel more like lucky mistakes rather than intended works of art, given how rare they are in the games medium. So, for a game like Submerged to even attempt to evoke something as specific as Shadow of the Colossus is definitely not a bad choice, but it’s certainly odd, considering the game doesn’t seem to be easily replicable. It’s not subtle about it either. You play a young girl from a third-person view, who speaks in an unintelligible language, ventures out into an open world, climbs massive structures, and frequently returns to aid her sick brother. And there’s one more similarity that to explain would ruin the trajectory of the story, but even without it, it should be clear that the team at Uppercut Games loves Team Ico’s game too. There’s more to it though. The game has a sense of loss that pervades its post-apocalyptic world. It’s not unlike what you get from Shadow of the Colossus’ ancient structures and ruins, but in Submerged, it’s crumbling buildings and teetering statues, half sunken in the sea. From afar, the game has a stunning palette of greens and greys and oranges, all set atop the huge blanket of blue. The camera will occasionally pull out as you crawl up the buildings and frame the girl amongst the other, grave-like skyscrapers jutting out of the water. It’s beautiful and makes you feel small, until it pulls back in and you see the grimy and repeated textures of the walls you spend most of the game on. The ugliness wouldn’t be a detriment if the buildings were designed to look like the actual remains of what they were, and not reorganized puzzle pieces of a game making toolkit. There’s only so much that the rusted company names and advertisements can flavor all the game’s repeated rectangular structures with the same broken windows. And that’s only the beginning of the effort you have to put into Submerged’s world to get over its shortcomings. Drifting through the vines and buildings is almost serene and melancholic as you survey what’s left that you can see and consider all that you can’t. For most of the game, I didn’t use the map. Instead, I was able to navigate using the game’s landmarks. But deeper into the game, when I had climbed most of its buildings, I was forced to use the map to search for the ones that I hadn’t yet. You do that by scanning your surroundings with a telescope, which automatically marks the location of the game’s collectible story items or the supply drops that the girl needs to bring back to her brother. Once you’re left with only a couple more supply drops, you might find yourself spending far too long cycling the telescope on and off as you sift through the buildings for what you missed. In a pretty revelatory moment early on I realized how beneficial it was to do that searching on top of one of the structures, where you get a much wider view. Even though that isn’t exactly a clever trick, it’s something the game never hints for you to do, and therefore felt like a self-discovered advantageous use of its mechanic. It was the kind of moment that only happened once, but it became a telling example of how frustratingly close the game gets to having memorable moments like figuring out what the fruit and lizards do in Shadow of the Colossus. 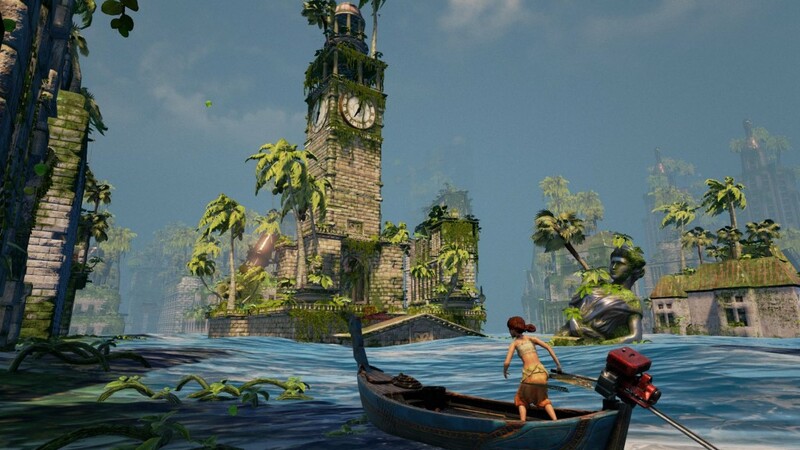 Submerged’s problem is its failure to align its presentation and narrative with what you do. Because it hides so much of its narrative and history behind drawings you find as you climb, you search for detail in the minutiae of its world and characters. But there isn’t any to find. The buildings blur together, the soundtrack repeats itself over and over, and the story of the boy and the girl doesn’t resonate with the world’s visual themes of rebirth and evolution. There’s no cohesiveness to your role in the game, like your actions don’t matter, which runs antithetical to the way the game doles out its narrative through your progress. But what Submerged attempts to do deserves the benefits of that kind of comparison, just as it deserves the damage it can do too. It’s a game that, on the surface, seems built for you to ask questions about what it presents, but once you dig a little deeper you realize it was never prepared to give you the answers. It’s not a conversation; it’s a speech. Submerged review copy provided by the publisher. For more information on scoring please see our Review Policy here.